A record amount of Club Doncaster Sports College students took part in the annual Christmas Cup competition, which ended in dramatic fashion with a tense penalty shootout. The annual cup competition, which takes place the week before the College has its Christmas break, saw a total of 115 students take part, as well as 19 volunteers to help organise and run the event. A standing tradition, the Christmas Cup started in 2014, and has gone onto become one of the biggest events in the College social calendar. The matches were competitive throughout, allowing the students to showcase their talents and let off some steam in the wake of their studies. Each College lecturer had his or her own team, which was selected by a random draw in the weeks preceding the event. Two teams from each of the two groups progressed, and after two penalty shootouts decided the semi-finals, the final was left to be contested between team Mark and team Craig. For the third game in a row, a winner had to be decided by a penalty shootout, with team Craig coming out on top. Head of Year 12, Ben Thompson, was pleased with the entire event, linking the importance of the event to the overall satisfaction of students enrolled at the College. 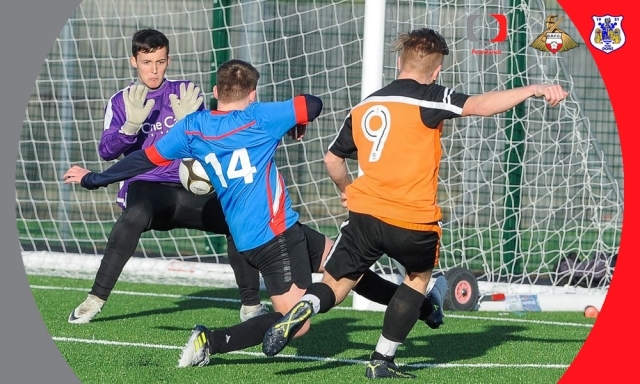 He said: "The Christmas Cup is an important event for everyone involved at the College. "We want to be able to give the students something which finishes off the calendar year in the right manner, and I feel the Christmas Cup does just that. It has proven time and time again to be a great opportunity for students to get involved. "A huge thank you has to also be extended to health and wellbeing officer Nick, who fed more than 130 people at the event, with the help of Queens Butchers."